Even in summer, my feet get cold, so I often wear socks or slippers around the house. These are light, sock-like slippers that are great for warmer weather. 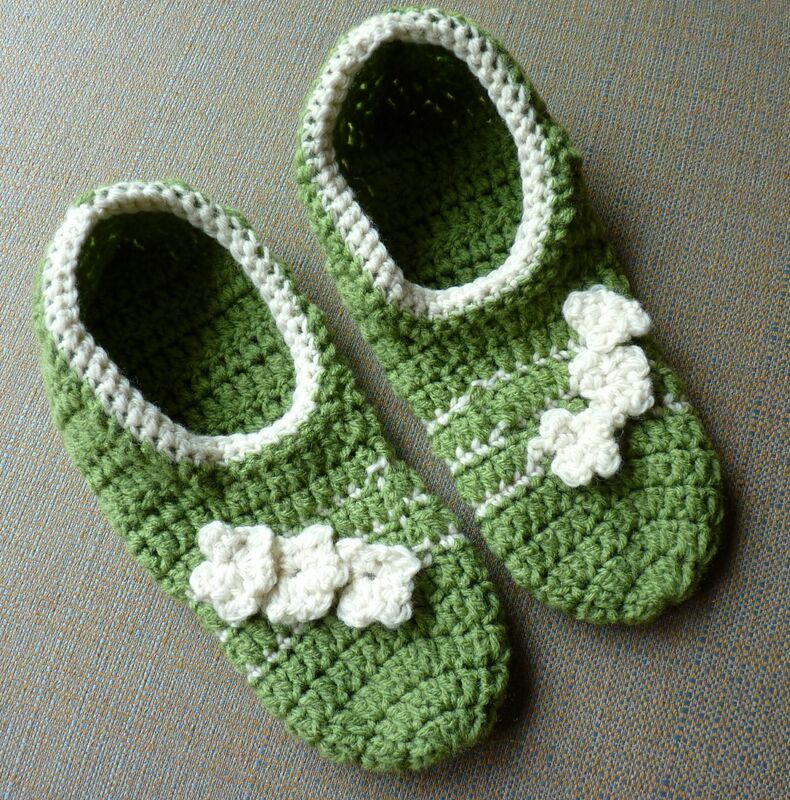 The free pattern for Pozy Toes Crochet Slippers is on Moogly. The green yarn is Red Heart Super Saver (color 0624, Tea Leaf). The off-white yarn is a wool yarn which is also a medium weight yarn, but it was thinner than the acrylic yarn, so the stripes don’t stand out like they should. 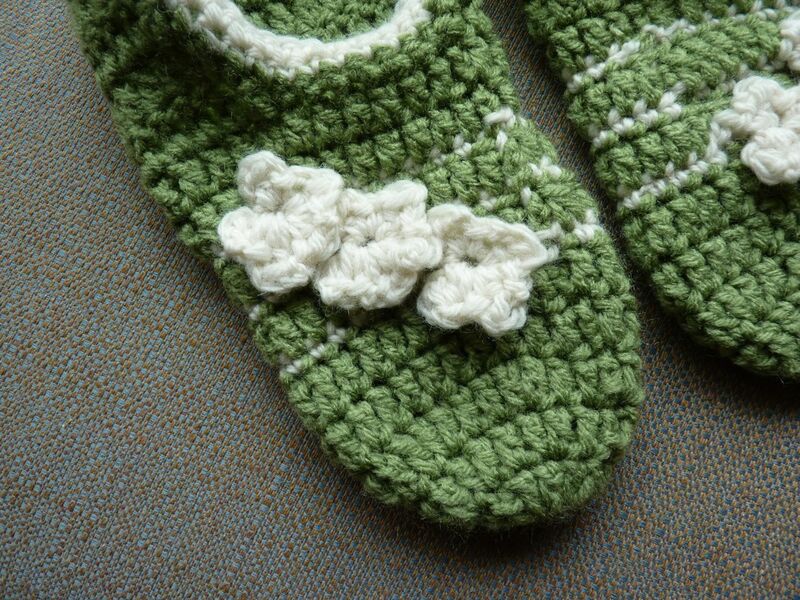 The flowers are crocheted right into the slipper, rather than being sewn on at the end. It’s a neat technique that I haven’t tried before. That being said, I had a heck of a time making them, which might have been because that yarn is so thin or it might have been because the flowers are so small (or a combination of both). There are different instructions for the right and left slippers – the slipper body is the same, but the flower pattern is different for the two sides. If I get the urge to make another pair, for a different look, I might skip the flowers and stripes and sew on a larger flower at the end. Not a slipper person? Take a look at these crochet-embellished flip flops! 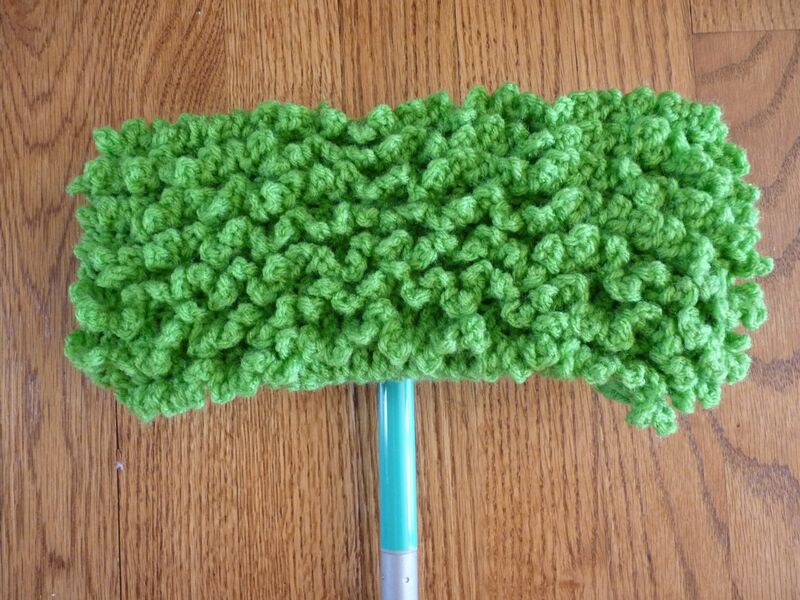 I’m all about crocheting useful things, so this sweeper cover was up my alley. 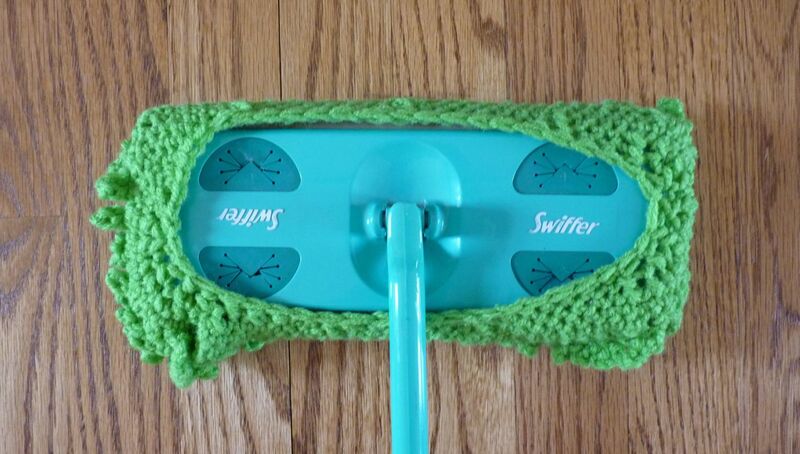 I love my Swiffer, and I do buy the cloths, but I prefer to use this cover on my wood floors. When you’re finished, give it a shake outside and then toss it in the laundry. I recommend hanging it to dry rather than putting it in the dryer. Here’s the loopy side. I didn’t take a photo, but you can turn it inside out to use the smooth side. Here’s how it slips on to the sweeper. 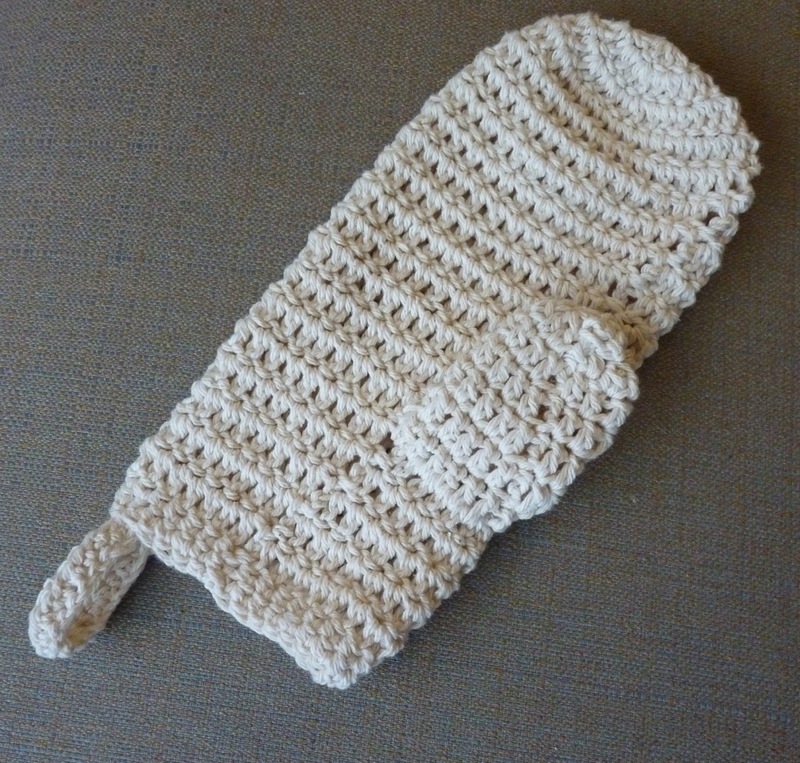 The pattern shows how to make this using two colors, but I wanted to use up this yarn, so I stuck with just one color. The bright green is the perfect thing to brighten up a cleaning session! The free pattern is available here on CraftStylish. The pattern starts out working in rows to create a rectangle with alternating rows of double crochet and loops (4 chains and a slip stitch). Next, the pattern switches to working in the round to create the part that holds the cover onto the sweeper head. The photos at the bottom of the pattern are helpful. If you have a different brand of sweeper, you might need a different size rectangle. Finished size will depend on the yarn you use and your gauge, so check along the way to make sure the rectangle will be a little smaller than your sweeper head. I was confused by the instructions for round 3 (this is when you’re working in the round, after finishing the rows). Here’s how I would explain it: on the long sides, sc 7 and then decrease in the next 2 sc; repeat until you’re 2 stitches from the corner. On the short sides, starting two stitches before the corner, decrease in the next 2 sc; repeat until you’re 2 stitches past the corner. So, you’re decreasing a little bit on the long sides and a lot on the short sides. Round 4 works the same way, but you sc 6 before decreasing on the long sides. Another hat! After I made a hat for myself, I made one for my husband. This one is a helmet-style hat that has a back flap that covers the ears and the back of the head. That extra protection, plus the thick yarn, makes this a nice warm winter hat. He gave the hat a thumbs-up and said that it feels light but is very warm. I used Lion Brand pattern L32053, Havemeyer Helmet (the pattern is free, but you may need to log in to view it). 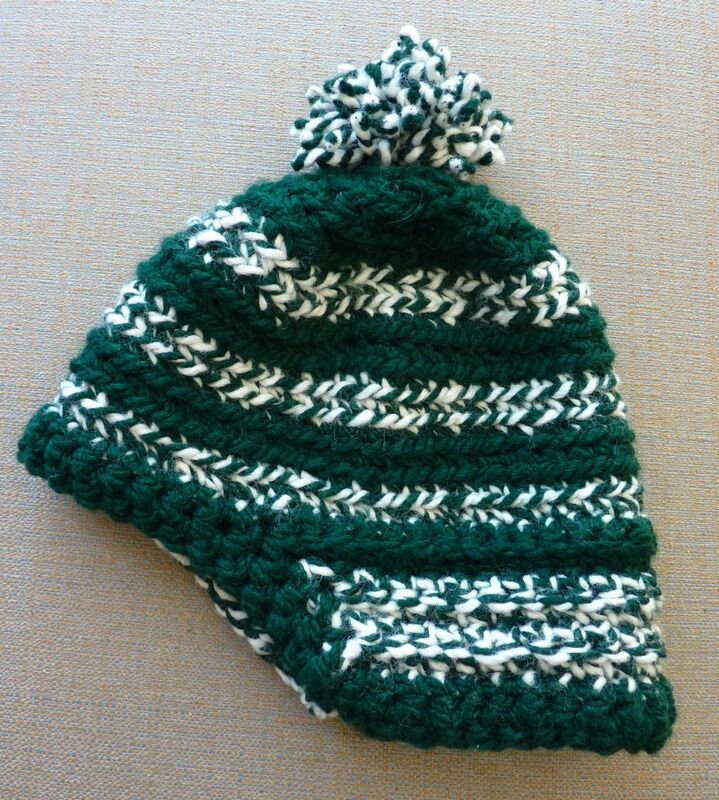 I used Lion Brand Wool-Ease Thick & Quick yarn in the Spartans color (dark green alternating with dark green & white stripes). I only had about 48″ of yarn left, so one ball was cutting it really close. The pattern calls for a size P crochet hook; I used size N. I usually go up a hook size, so going down two sizes was very unusual for me. 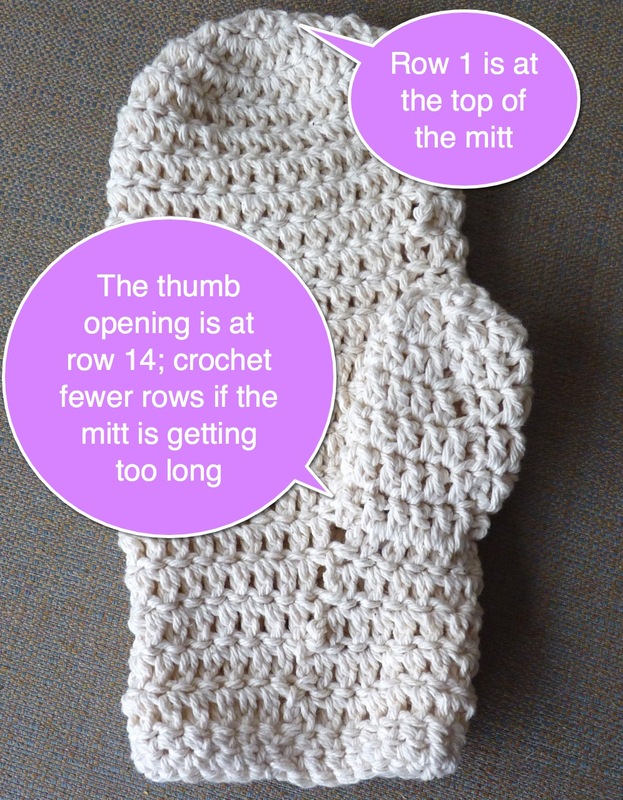 There were a couple of unfavorable reviews for this pattern, and I think the recommended hook size must be way off, so people are having trouble with the gauge. I had to try a few different times to figure out what size hook to use. Once I did, though, it was an easy pattern to follow. To make the pom-pom, I used the technique shown in this video. 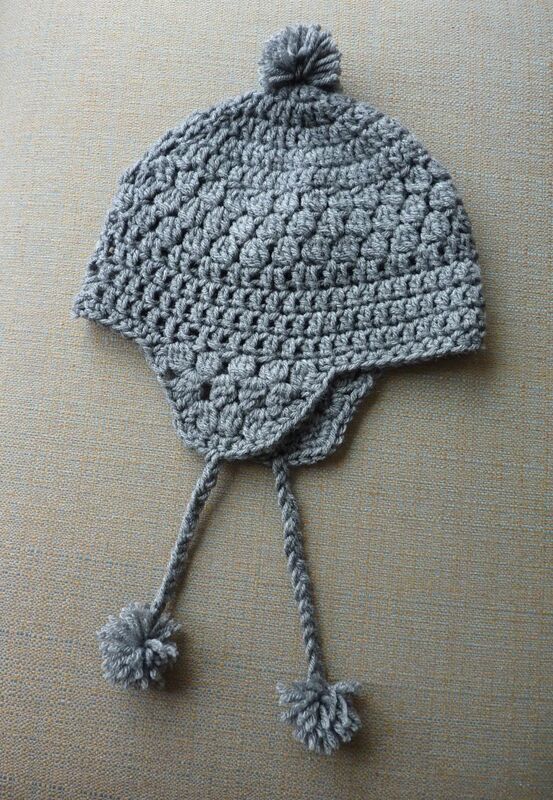 This was the first time I crocheted a hat, and I’m happy to say that it was easier than expected and just as cute as I hoped it would be. I don’t love wearing hats, but it’s been quite a winter, what with the Polar Vortex, and seemingly constant snow, so hats do come in handy. You can see more about the pattern, including photos of the hat on someone’s head here, and you can purchase the pattern here on Ravelry. I was lucky to get a copy of the pattern when she was giving it away for free, but it’s only $4.00 to buy it, and I think it’s worth it. I used Red Heart Super Saver yarn and a size K crochet hook (one size larger than called for, but I usually do that because I crochet with a lot of tension). The pattern is very detailed and I found it easy to follow. She includes links for making the braided tassels and pom-poms. I had some trouble with the pom-poms, so I used the technique shown in this video (I wrapped the yarn around 3 fingers to make a smaller-sized pom-pom). 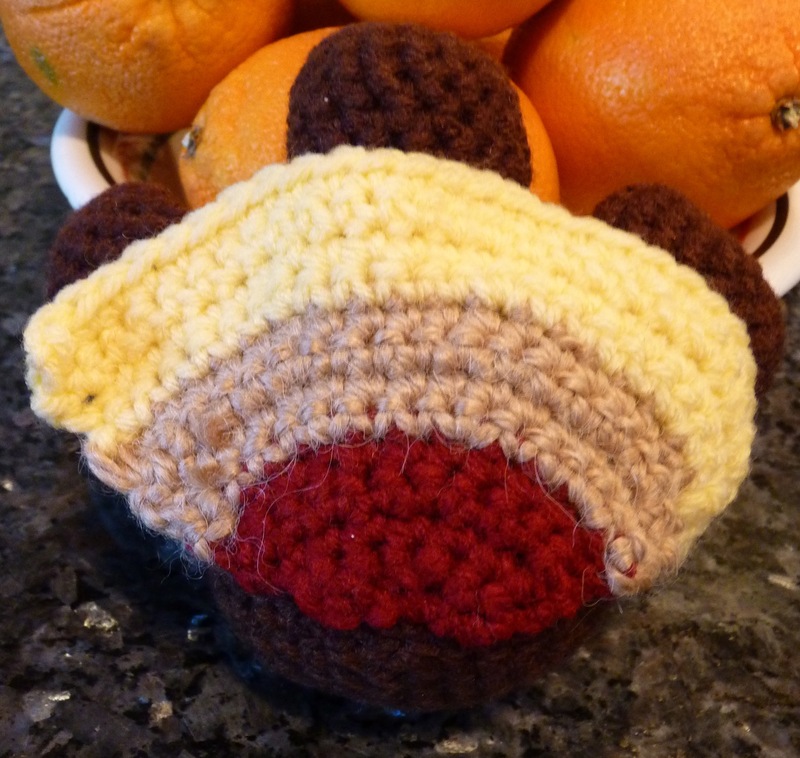 I made Tom Turkey a few years ago, and it’s always fun to put him on display in November. The pattern is Tom Turkey (#80744AD) from Lion Brand. It’s a free pattern, but you may need to log in to view it. 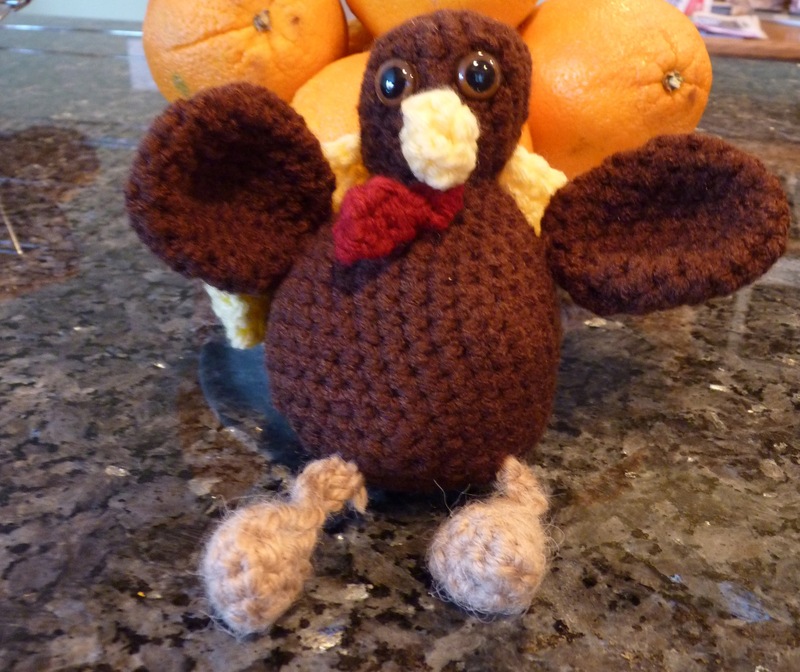 Be sure to look at the reviews – there are photos of other cute turkeys that people have made using the pattern. I see a lot of craft ideas online that go on my “someday” list. But these Kitschy Christmas Ornaments from Wild Olive, went on the “right now” list. These are as cute as it gets, and I wanted some on my tree this year. So far I’ve made three, and I think I’ll have at least a few more ready by the time the tree is up. The instructions are just $5.00, and they’re very detailed and helpful. I’ve never made anything like this before, but I was quickly up and running after reading through the information. 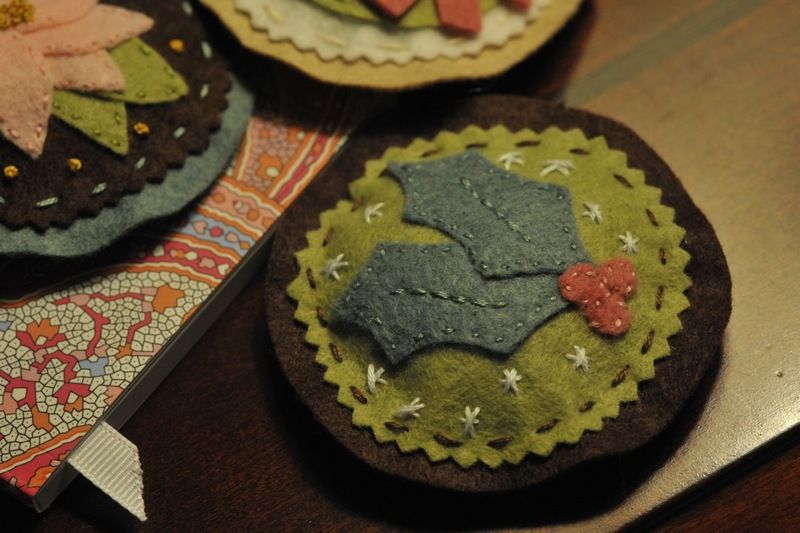 In the instructions, she mentions using freezer paper to trace and transfer the pattern pieces to the felt. This was new to me, but let me tell you – it’s magical! A quick pass with the iron adheres the paper to the felt, and then it easily peels off with no residue. I found a good primer on freezer paper here on Make it & Love it. To make things really, easy, you can buy a customized felt collection and matching embroidery floss. I didn’t need the floss, but I bought the felt. I’m not a felt expert, but the wool felt is definitely nicer than the basic felt that I’ve bought at the craft store for other projects. 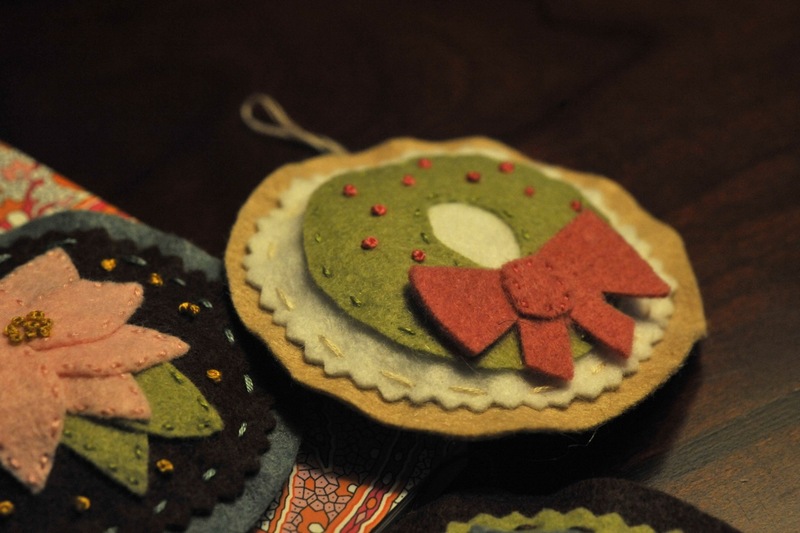 Most of the stitching is basic, but if you need a tutorial on French Knots (those are the little dots on the wreath and the poinsettia), hop over to Sublime Stitching. 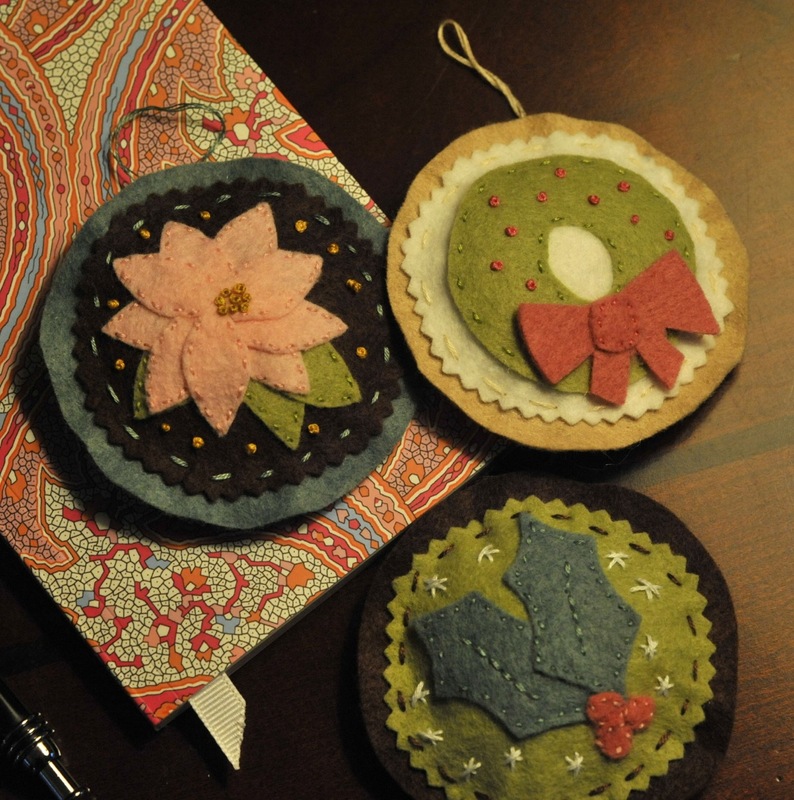 Photos of all the ornaments, plus links to purchase the pattern and the felt are here on Wild Olive’s blog.